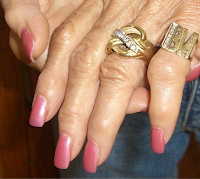 Karen at Of A Certain Age published a shot of her neighbour Betty, and I noticed her long squared nails, painted rich coral. This is a look popular since at least the mid-70s, and though Betty is beautifully groomed, there are more current looks. I'm not suggesting she change her sassy retro manicure, only that styles do move along as the decades pass. 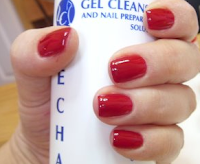 If you wear gel nails, or prefer a longer natural nail, here's the more current shape, the just-past fingertip length squared oval, in red, far left, and on natural nails with clear polish, near left. The pale, subtle manicure on a beautifully shaped oval nail shown with a glass of champagne belongs to Helen Mirren, who wore this look to the Academy Awards. A favourite of mine, because I can do things with my hands, yet still have the punch of polish. I think darker polish looks most modern on short nails, and manicurists say it adheres better. The "Red Buttons" sported by Diane Keaton show that the look works for mature women, too. Here to stay (although not in France), French manicures are beloved by so many women that I anticipate some protests when I call them rather dated. The advantage is that the manicure goes with anything. If French is a fact of life, wear it like Eva Longoria's, shown at far left, in soft pink and cream polishes that subtly merge. Aggressive talons with harsh white tips that look like the old typewriter correction fluid White-Out, near left, are hard and passé. The soft, classic manicure that features no polish, simply shaping, cuticle care and buffing is ideal for those who work with their hands, anyone who wants to avoid using solvents and other chemicals, and those who prefer a simple yet groomed look. For directions, see The Natural Manicure on the Healthy & Green Living site. I've found keeping up the natural manicure actually takes more time than a salon-polish job. 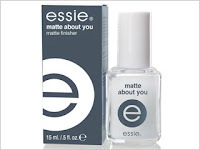 Clear matte polishes like Essie's Matte About You make nails look softly buffed but last longer than a buff, which is actually a very light wax. You can also wear it as a topcoat on sheer or deep shades to create the velvety matte effect. Sally Hansen Instant Shine Natural Nail Finish is a similar product and comes in matte and light shine. Best of all, it wears off gradually so you don't have to use remover. I'm showing matte polish in navy to show nail shape and the deep, light-absorbing effect. The nails look like polished stones. (And once again, there's that current, not-too-long shape.) A white-haired woman with navy nails would certainly turn heads. OPI, betting on a trend, is releasing six of its most popular shades in matte formulations this summer. You can experiment with matte by using the Essie Matte About You as a topcoat. At the other end of the upkeep continuum, we have the the half-moon manicure. The 1920s nail trend invented by a manicurist at MGM Studios resurfaced in striking color variations (purple and cream, navy and white) at Christian Dior and Thakoon. “It is ‘le must’ in terms of elegance,” said Elsa Deslande, the manicurist for the Dior fall couture show. But she advises you not to try it at home. “It is a very complex aesthetic technique that is practically impossible to create on one’s own,” she said, noting, too, that it requires a specific length, width and shape of the nail, which only a few people have (Dita Von Teese, among them). Here's the classic Von Teese red half-moon manicure. Not an everyday look for most of us, fun for a party or when you're in a burlesquey mood. I avoid effects like sparkles, tiger stripes and seasonal artwork, despite my local salon's manicurists, who seem to live to apply flowers or shooting stars. Good taste does not necessarily come with the nail technician's certificate, so insist on what you want. LOL, my local nail salon is also crazy for the "nail art" too! My nails are thin and just don't grow much, so I've been keeping them quite short the last few years. May have to try that dark red polish; I love how it looks on others! I love that half-moon look. Having played piano since I was 5, even by my teens I couldn't tolerate nails with any length at all. These short, dark nails might suit me -- I love how they look in your photos here-- but as a gardener, I'm not sure it's worth the upkeep. I do like a regular pedicure though. Love the navy nails but agree with materfamilias on the upkeep. Check out Hungry Zombie Couture blog for a weekly (Mondays) update on nail polish color trials. I might try a brown matt this Autumn. I want to keep my nails looking natural; short and only with a hint of gloss or pearl ( Chanel has a pale blueish that looks great). I too need my hands and I don´t want my rings-when I wear them-to compete with the nail color. Pseu: Dark red is my autumn through winter treat, I DIY with pale in between. materfamilias: Pedicures are essential for me too, though go without polish in winter to give the nail a rest. DO you? Maggie: Big thanks for the Hungry Zombie site info! Anjela: The jury is out on how matte wears, but matte chocloate nails are intriguing! Drisana: Isn't that just half the trick though? The moons are painted another colour in the example from the NYT, and that crisp line between the two shades is quite a challenge. metscan: I'm going to get that Chanel shade, thanks! I love the OPI Matte Envy polish, but the fumes got too much for me, so I'm trying to stick to buffing. Belva: I used Nail Envy for years (matte) but I find it yellows after a week or so... but hey, what do I want? I think the short, dark nails are very chic, but I'm not sure I could maintain even something that simple ... I think I'm a bit too low-maintenance, although you've motivated me to have a manicure for a wedding I'll be going to soon. On the other hand (or foot), I NEVER have unpainted toenails! I do the dark red (almost black) in winter and a hot pink/red in summer, usually. My eight-year-old saw me between nailpolish one day and said 'Oh my god, what happened to your feet?!'. Tiffany: That's so cute! I like to get a salon manicure for occasions and do my own (pale) in between. In summer where I live dark red-burgundy looks too heavy but I do like roses, corals or pinky summery reds. I keep mine short and I like dark matt colours - blue, purple, turquoise (gets a lot of comments) and black. mardel: I like Lincoln Park too, or one of the darkest reds in winter. I do try to resist for 4-6 weeks to let the nail breathe for a change. Not sure it matters, though. Alienne: You are daring, compared to me, and I'm going to try a colour from your palette! I am newly in love with a navy mani, after seeing your photo! And I am going to try it for a special occasion. Incidentally, am silver-haired. About the thick, blunt, correction fluid manicures, why, oh why, are they still out there? I consider them ghastly. Ditto for most of the nail "art" (really??) that I see women wear in real life. I like edgy, done right. I prefer classic. Fun post, thank you. PS: keep trying to get the work out about those dated styles.